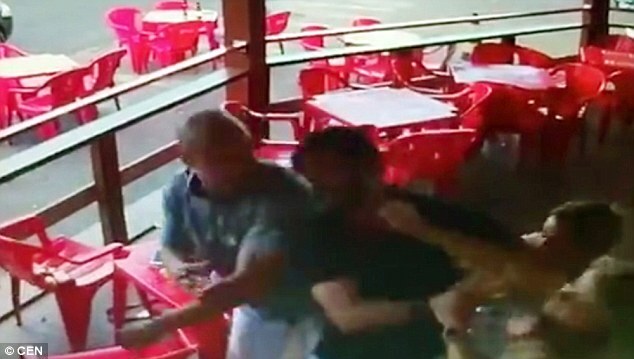 In a video that has gained attention online, a woman appears to attack her boyfriend’s lover when she discovers the two of them together at a cafe. 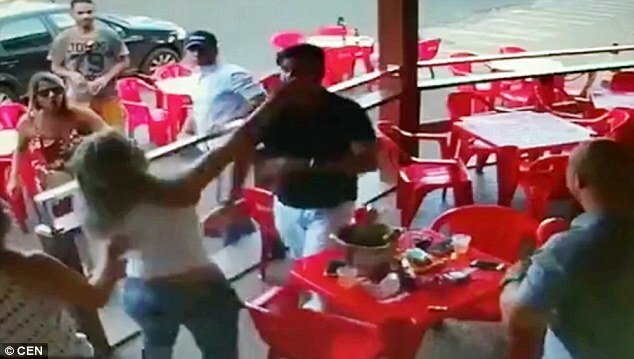 In the video, a brunette woman approaches a male and female couple at a table and punches the man in the side of the head, then grabs the blond woman’s hair and drags her into a brawl on the cafe’s floor. When the blond woman manages to free herself, she grabs a chair to defend herself from the girlfriend’s attack. Later in the video, after the fight continues off-screen, the blond woman hits the man in the head and then walks away. No one in the video has been identified. Commenters questioned the woman’s motivations for the attack. In a similar but more extreme case from Brazil in 2016, a video showed a wife attacking her husband’s mistress before reportedly throwing her off of a bridge, according to the Mirror. The description included with the video said the woman had found the victim cheating with her husband. In the clip, the woman was thrown off of a 10-foot-high bridge with the help of another woman. It was unclear whether she was injured in the fall.